Several weeks ago Mother Loraine Marie Clare, superior of our Baltimore province, received a letter from the United States Conference of Catholic Bishops’ Secretariat of Pro-Life Activities, informing her that our Congregation had been chosen to receive the “People of Life Award” at their annual Diocesan Pro-Life Leadership Conference, which was to take place July 27–30, 2014 in Charleston, South Carolina. She was invited to attend a Mass and banquet there Monday evening, July 28, where the Award would be presented. Two of us traveled south to attend the July 28 Mass at Charleston’s Cathedral of St. John the Baptist, followed by the banquet at the Francis Marion Hotel. Boston’s Cardinal Sean O’Malley, O.F.M. Cap., current chairman of the Bishops’ pro-life secretariat, was the homilist at the Mass; he also presented the awards. In his homily he spoke about how the pro-life movement must be a work of mercy that knows how to show equal concern for the unborn child and the mother. “It must be clear that our motivation is love and our context is mercy,” he said, echoing the refreshing teaching of Pope Francis.Along with our Congregation, two individuals were presented with the annual “People of Life Award” — Sheila Hopkins, immediate past director for social concerns and respect life at the Florida Conference of Catholic Bishops; and George Wesolek, director of public policy and social concerns in the archdiocese of San Francisco, who was given the award posthumously and was represented by his wife and daughter. Each of the award winners was introduced by a member of the USCCB pro-life staff. Deirdre McQuade, assistant director for policy and communications at the USCCB, presented our mission and charism, referring to our apostolate as a “round the clock witness to the Culture of Life.” During dinner she had explained to us that the “People of Life Award” winners are chosen by the USCCB staff based on their long-term commitment to the Gospel of Life. Recipients, she said, are often the “unsung heroes” of the pro-life movement. While our stand against the HHS Mandate and all of the publicity it has generated was a factor in their decision to bestow this honor on the Congregation, she said, we were happy to learn that we were also chosen based on our longtime daily service to the most vulnerable elderly. 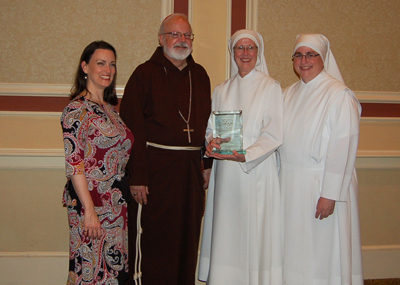 As daughters of St. Jeanne Jugan we never quite grow accustomed to public accolades, and yet we were pleased to be recognized as “unsung heroes,” a title most befitting our humble foundress! Read USCCB press release here.